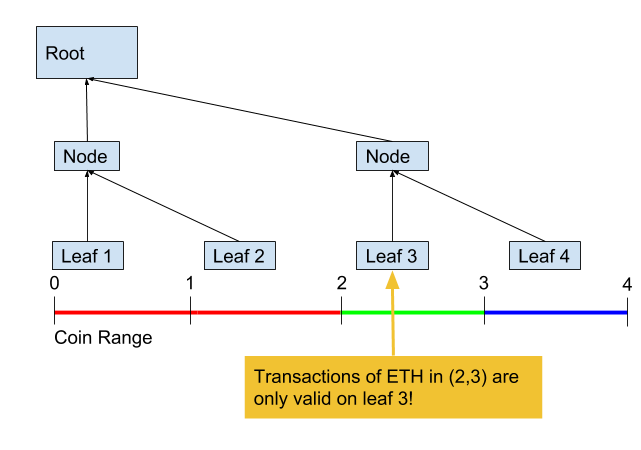 This post examines fungibility in Plasma Cash and how it relates to safety proofs. It first argues that one of Cash’s main innovations was to introduce coin ordering via a number line, decreasing fungbility in exchange for light client proofs and mass exit prevention. On its own, this “range-based” transaction format removes the mass exit vulnerability even with full node, MVP-format blocks. 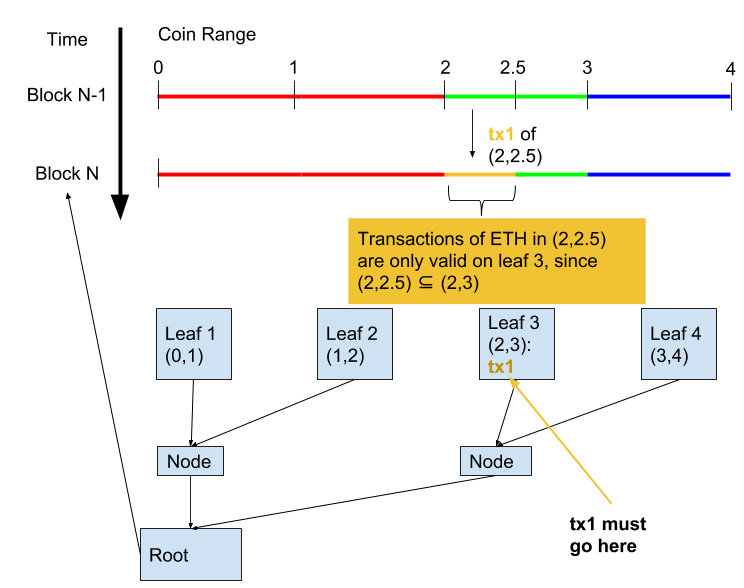 Next, it discusses how merkle trees give blocks light client proofs, and motivates the merkle sum tree construction of blocks, which can further reduce leightweight proof size from O(log(# coins)) to O(log(# txns)). It’s well-established that Plasma Cash’s poposal to represent coins as non-fungible tokens introduced two key improvements: light client proofs and nullifying the mass exit vulnerability. However, it’s not ideal to interpret Cash coins as equivalent to ERC721s. In general, note that coin fungibility is not “yes/no”–for example, shielded ZCash outputs are “more” fungible than BTC/ETH, because we can trace the Silk Road coins and view ETH balances. Another interpretation is that Cash treats coins as ranges “on a number line” instead of “in a pool” like MVP did. 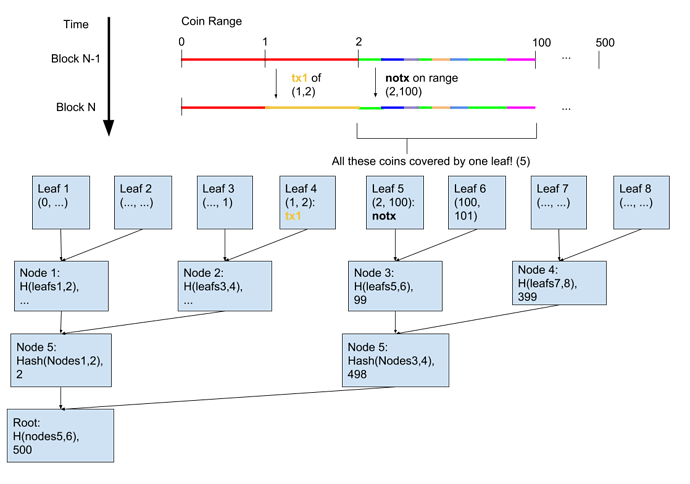 This will allow us to guarantee safety on subsets of exits–a particular range–even without a sparse merkle tree of NFT transactions like in Cash. 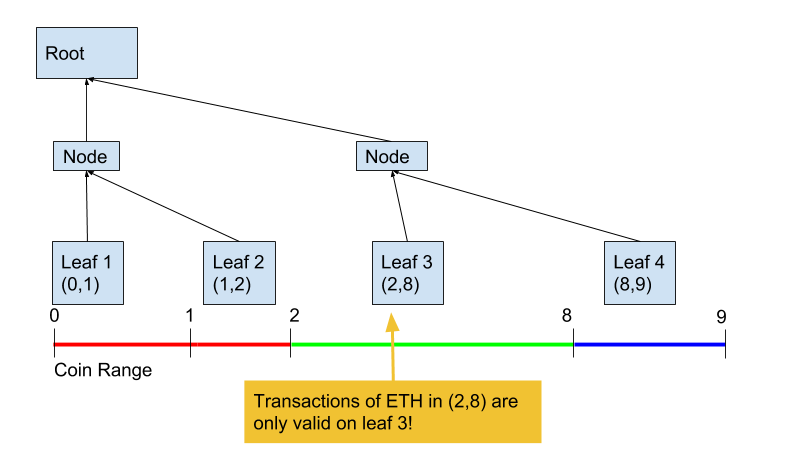 In plasma MVP, the operator could create an invalid (“out-of-nowhere”) transaction, and use the UTXO to create an invalid exit. This exit is not properly challengeable because its (invalid) history is withheld. The original solution forced all users to speedily exit the contract themselves, before the unchallengeable exit got the chance. 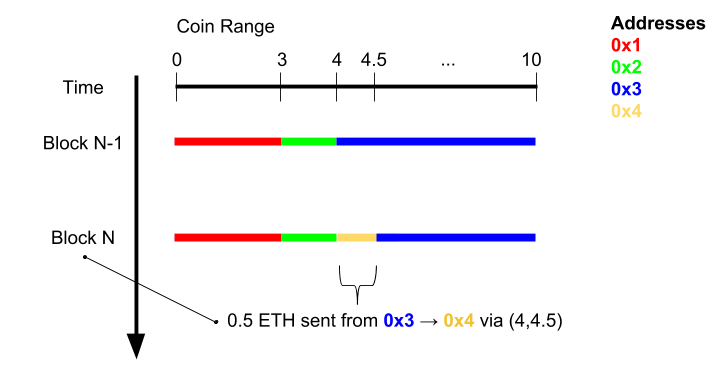 In this example, 0x5’s wrongful exit can always be challenged by the rightful owner, 0x4, by pointing to the transaction in block N. When 0x5 can’t respond by showing that 0x4 spent the output, the exit is cancelled. The problem with MVP was that nobody in particular had the responsibility to challenge an “out of nowhere” spend. In this model, someone always does–the range’s true owner. It wouldn’t do much, but we could still construct a valid exit game with unequal branch sizes. The only way for yellow or purple clients to know of the other transaction is to download the opposite colored branch–but they don’t know it’s there! So clients would have to download every single leaf to check for double spends…no more light clients. With a few tries, you’ll see it can’t be done anywhere without changing the sum at one of the green nodes. Thus, using only the green branch, we can be confident that no valid, intersecting branches exist. 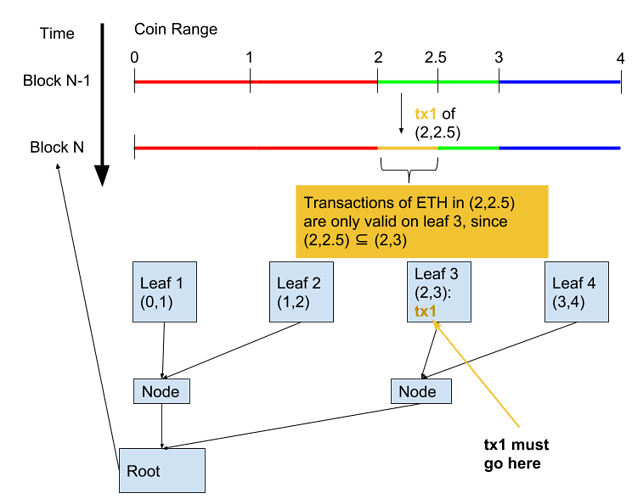 In the worst case, if every transaction is separated by untouched coins, the number of branches needed would be just twice the number of transactions. This is comparable to needing as many branches as coins in fixed-denomination Cash. 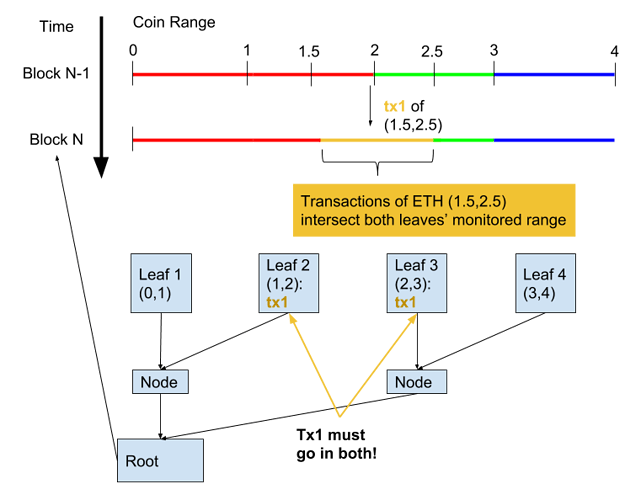 It’s reasonable to assume coins are transacted much less frequently than once-per-block, so a branch size decrease from O(log(#coins)) to O(Log(#transactions)) might increase throughput significantly. note: The sum construction (and many conversations that influenced this post) stemmed from the Plasma Cashflow doc last month. Edit: this scheme was discovered to be broken, see discussions here. With this realization, I believe vector commitments may be the best way to develop a scalable succinct proof scheme. Using a secondary cryptographic accumulator which also “watches” coins is a promising way to prevent coin histories from growing linearly in blocks, by using succinct non-inclusion proofs instead of downloading empty (notx) branches. Previously, the bottleneck for RSA accumulators was that each Cash coin required its own prime number to (dis)include from the accumulator each block. 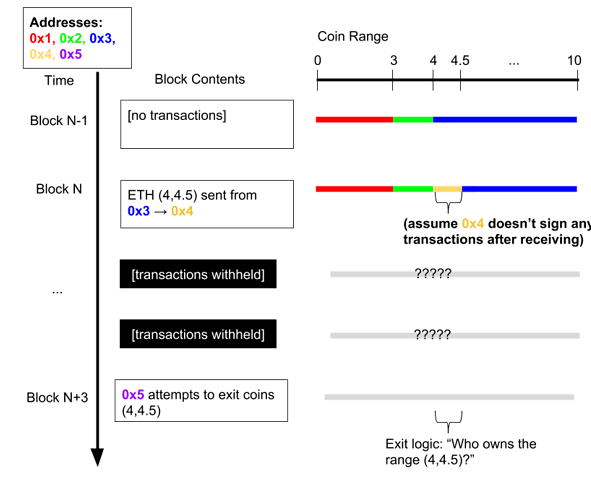 This requires a huge amount of prime numbers–restricting the coin carrying capacity by how many primes can be enumerated and the transaction capacity by how many witnesses can be calculated. Vitalik found an awesome way to reduce the witness computation, but this still requires us to enumerate O(N) primes, one for each Cash coin. Not unlike the sparse tree, these constructions were cumbersome because the range which each prime covers is stuck, fixed at the smallest denomination. We can construct a scheme where the primes cover varying ranges, like the merkle sum branches do. With the condition that a new transaction intersecting (startpoint, endpoint) is only valid if the newPrime listed by its previous owner was included in the RSA for that block. This might introduce a small coordination cost, but it also reduces the RSA bottleneck significantly. The right strategy could limit the number of primes enumerated to the number of fragments or lower and support O(1) inclusion and non-inclusion proofs for dynamic ranges. 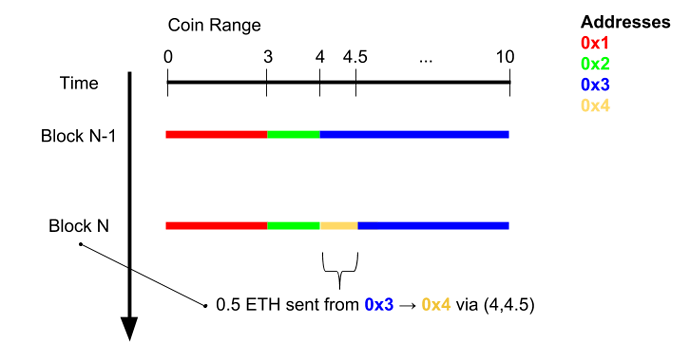 The goal of this post was to present a different way to think about Plasma Cash, imagining deposited coins as ranges on a number line. 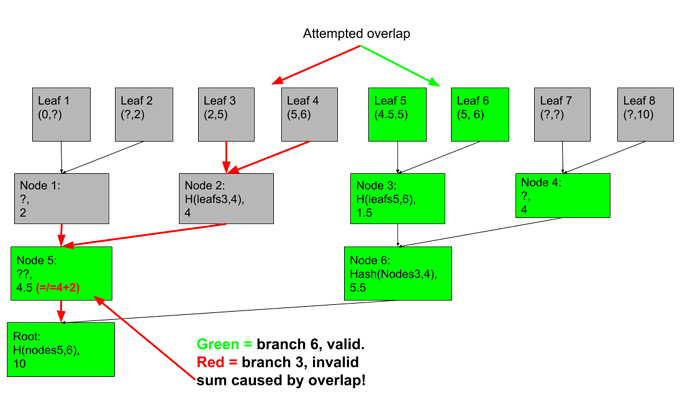 These safety mechanics, not just the merkle tree structure, allow for a strong design space with light client proofs and mass exit prevention. While I think the constructions above are generally worthwhile, they do add complexity. The exit games now have to compute logic about ranges and their intersections. Also, the merkle sum structure requires extra gas to validate, though it’s also over a shorter merkle branch. 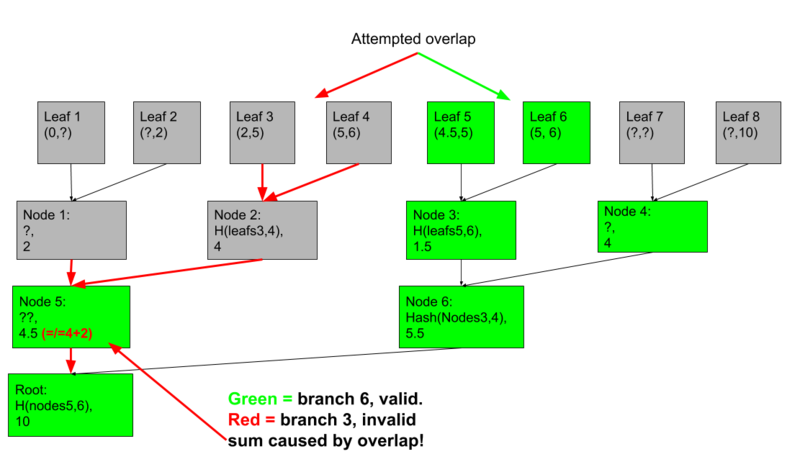 It’s possible that a coarse-grained merkle tree would afford most of the same benefits in practice. Also, all of these schemes require range defragging to prevent dust, like we need for plasma Cash. This requires coordination around specific atomic swaps. Lastly, privacy worsens when sharing ranges or primes–you leak more information to your neighbors compared to the uniform tree constructions. However, I think that privacy should be added separately to plasma rather than at the cost of performance. Lots of ZK crypto could add this–as one example, TumbleBit-style blinded mixing during defragmentation. Adding performance will eventually increase privacy by allowing more users to share the same anonymity blanket. Regarding privacy and zk-crypto, do you if there is a variant of plasma that’s focused on privacy as it’s main feature? 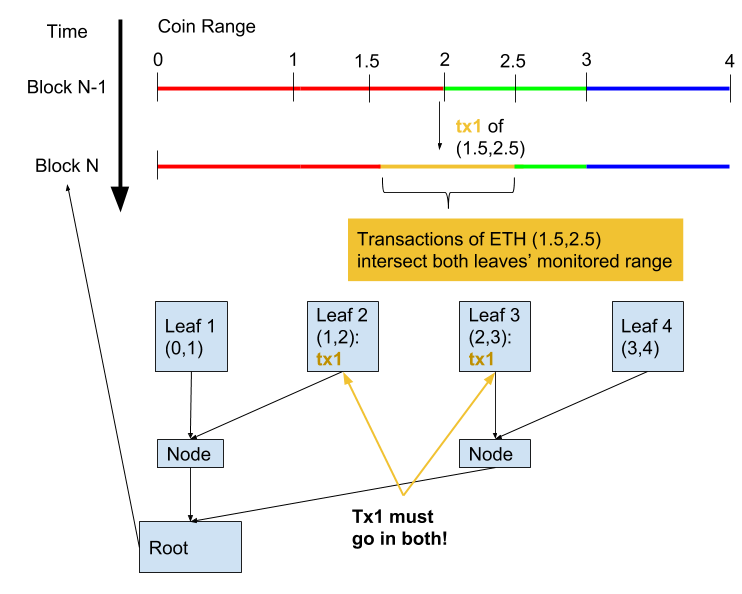 I do not know the relation ship between sum Merkle tree leaf and transactions. Can someone explain this in detail? It’s the same format as the Merkle Tree, but an additional value is added to every node called the “sum”. 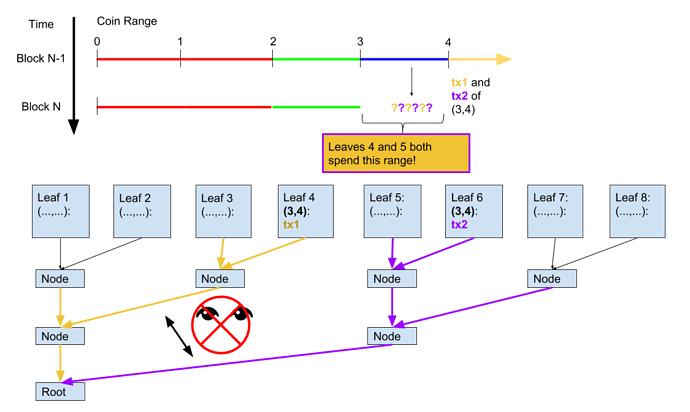 The leaves are arranged in such a way that they represent a number line.